Juventus coach Antonio Conte says English official Mark Clattenburg was not good enough to referee their Europa League semi-final against Benfica. Clattenburg handled Thursday's second leg, in which Benfica earned a 0-0 draw to eliminate the Italian leaders. First Champions League match: 6 August 2008 - MTK Budapest 0-5 Fenerbahce. 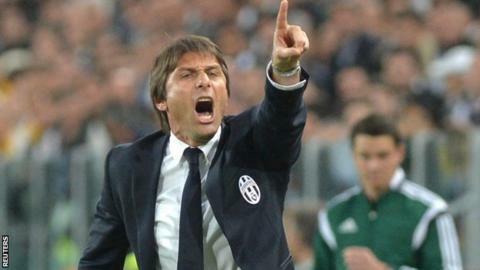 "I didn't appreciate either the attitude of our opponents or the referee," said Conte. "Uefa should show us more respect by sending a referee of the required standard." Juventus, who will win their third straight Serie A title by beating Atalanta on Monday, failed to overturn a 2-1 first-leg deficit with the stalemate against the Portuguese champions. Benfica's success prevented Juventus from competing in the Europa League final in their own stadium, with Jorge Jesus' men returning on 14 May to take on Spanish side Seville. Conte was adamant that Clattenburg should have awarded his team a penalty when Benfica captain Luisao appeared to handle Fernando Llorente's 65th-minute header. The ex-Italy midfielder, 44, also believes the Premier League referee, who sent off Benfica's Enzo Perez shortly after the penalty appeal, did not control what he perceived as spoiling tactics from the away side. "The referee allowed them to obstruct the play the whole game," added Conte. "Before the game he told us that he wouldn't stop play every time a player hit the floor, but that's what happened." Clattenburg, 39, was appointed as a Fifa referee in 2006 and has since refereed matches in the Champions League, Europa League and European Championship.